Imagine a building that “breathes”. The open joint terracotta rainscreen system allows air to circulate behind the panels to provide pressure equalization, preventing water from being drawn into the building. This natural “breathing” ventilation prevents any mold or mildew from growing inside the wall. Condensation is not trapped in the wall, which makes for it is an extremely healthy, durable and long lasting building enclosure. There is both insulation inside the building walls, and also a continuous blanket on the outside. By locating the insulation outside the air/vapor barrier, the condensation is continually evaporating due to air movement. The result is a 50 percent higher insulation value which reduces energy consumption, resulting in healthy wall construction as well as substantially improved comfort and productivity for the occupants. Since this virtually eliminates air filtration and exfiltration, the HVAC system can be substantially reduced. Airtightness is important for both energy efficiency and comfort. Cold air leaking into the building through gaps and cracks increases the building heat load. In typical homes, infiltration typically accounts for 25 percent or more of heating and cooling energy consumption. Across the entire residential sector this equates to over 600 average-sized coal-fired power plants. 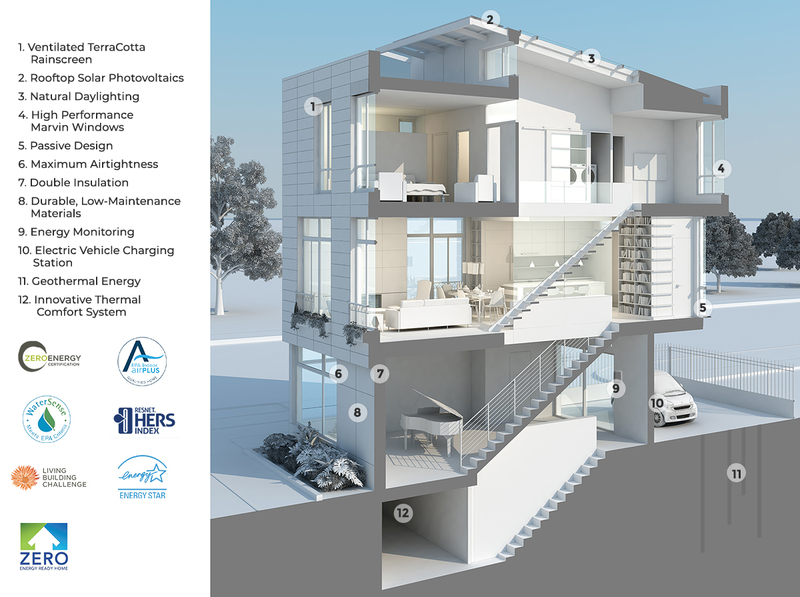 This high-performance building is built with a very tight envelope, and then provides ventilation in a controlled, reliable way with an Energy Recovery Ventilator (ERV), which is a fan-powered ventilation unit with a heat exchanger. Comfort and resiliency is the basis of our mechanical system. Each townhome has a variable-speed water-to-water geothermal system. It is the Swiss Army Knife of heating and cooling. One compact unit provides radiant in-floor heating, cooling and domestic hot water. In addition, we have a back-up air cooling system in the attic for those few days a year of high temperatures. Fresh air is important in a super insulated, super tight house, so we also have an Energy Recovery Ventilator (ERV) to provide controlled fresh air exchanges. Each townhome has its’ own photovoltaic (PV) panels that are net metered by the City of Fort Collins Utilities Department. The PV system provides all the power required with super-efficient 345-360 W panels. Large energy efficient skylights are over the stair way to provide ample daylight in all the townhouses. Skylights can make a major contribution to energy efficiency and comfort. They are an excellent source of natural light, perhaps admitting more than three times as much light as a vertical window of the same size. In addition, the skylight has integrated shading to filter light as needed. High Perfomance and high design Marvin wood clad windows filled with argon gas for maximum R Value and comfort. The hydronic radiant heating and cooling system heats and cools a structure by circulating warm or cool water through flexible PBX tubing located in the floor. Because water has the capacity to transport energy 3,500 times greater than air, a hydronic radiant heating and cooling system can provide greater comfort to a space using less energy than forced-air systems. Especially in our dry climate, radiant heat and coolth is much better than forced air. Radiant provides a quiet, even temperature and eliminates the allergy problems associated with ducts. The importance of passive design cannot be overstated. It takes advantage of the location and climate to maintain a comfortable temperature range in the townhomes. 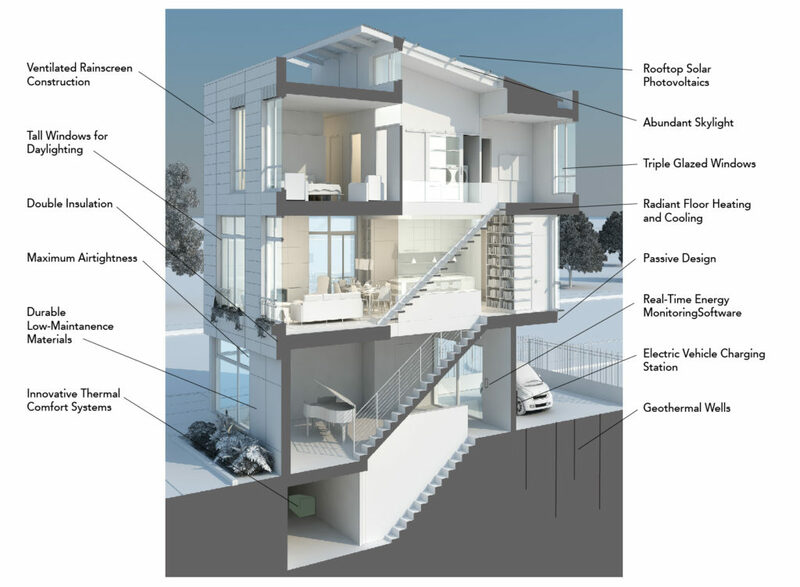 Passive Design reduces the need for auxiliary heating or cooling. 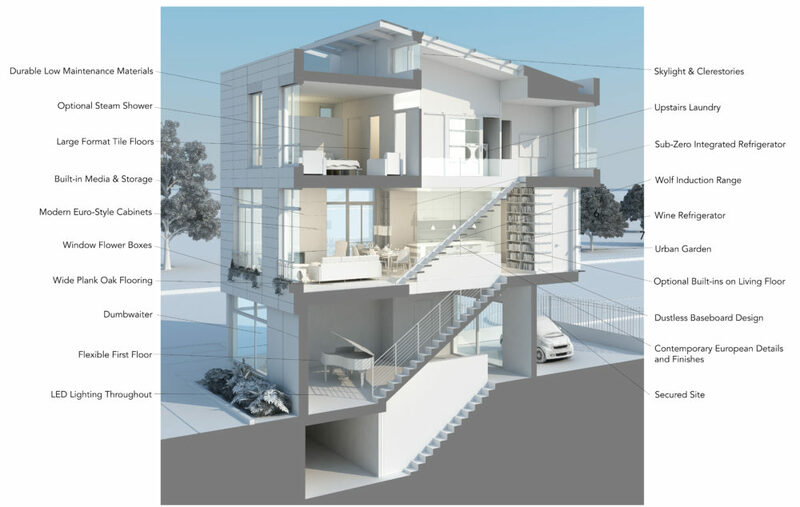 The strategies used are solar orientation, building form and massing, overhangs on the south, glazing choices, insulation, thermal mass, and air/water tightness. 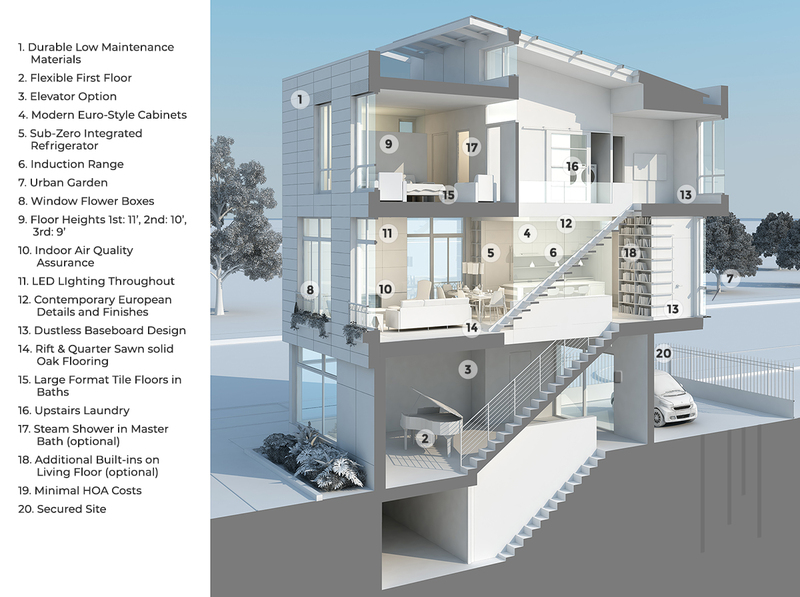 The building’s passive design effectively ‘locks in’ thermal comfort for the life span of the home. Geothermal Energy is the most efficient and environmentally friendly heating and cooling system available, 300-500% more efficient than conventional furnaces. Geothermal energy is the heat from the Earth. It’s clean and sustainable. Our geothermal energy comes from 7 350’ deep wells with glycol loops that capture the constant temperature of the earth to reduce energy needed to condition the building. A level 2 Charging station is to power the shared electric vehicle which will be available to home owners through a L’Avenir Mobile Phone app. User friendly monitoring software, available both on a mobile app and a computer, tracks both energy production and energy use in real time. With this easy to use interface, the home owner can feel confident with the energy bottom line every month. Window height in relationship to ceiling height is the biggest factor in getting the maximum amount of natural daylight. Our windows are flush with the ceiling, allowing the space to be almost 90% daylit. It also contributes to passive solar heat gain in the building during the cold months and helps keep energy usage down during the day. Windows are non-conductive fully insulated fiberglass frames with for ultimate comfort in both summer and winter. The window unit has a suspended film that reduces convection and energy transfer, and improves acoustic performance. The insulated unit is filled with Argon gas for maximum R-value. Geothermal Energy -The most efficient and environmentally friendly heating and cooling system available which is 300-500% more efficient than conventional furnaces. Geothermal energy is the heat from the Earth. It’s clean and sustainable. Our geothermal energy comes from 7 350’ deep wells with glycol loops that capture the constant temperature of the earth to reduce energy needed to condition the building. Electric Vehicle Charging Station – A level 2 Charging station is to power the shared electric vehicle which will be available to home owners through a L’Avenir Mobile Phone app.